Serendipity brought Tidewater Community College librarians Carol Hodges and Amanda Flayer together. While traveling with Horticulture Professor Ken Spencer’s study abroad group to Guatemala in August of 2010, Hodges took a side trip to visit a library. It was there that she made the connection with Flayer, an American and former Peace Corps volunteer, who now directs La Puerta Abierta (The Open Door), a library for children. Back in the States, Hodges continued corresponding with Flayer, and soon a love of books and people brought them together to form a sister library partnership. “After serving on the American Library Association’s (ALA) International Relations Roundtable, I learned about the sister library program, and the idea intrigued me,” Hodges says. With the support of Mary Mayer-Hennely, associate vice president of Learning Resources, and librarians college-wide an official partnership was formed and sanctioned by the ALA. “Now this partnership has become my passion, and it’s my privilege to offer help and hope to the children of Guatemala,” Hodges says. TCC’s sister library partnership has been under way for close to two years. The college-wide effort has included book drives from a Spanish Club, as well as individual donors. So far, the TCC family has donated more than 140 pounds of books and school supplies to Biblioteca Puerta Abierta Atitlán. 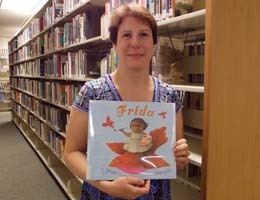 “It’s a challenge purchasing books for the children, as they must be written in Spanish and be culturally sensitive. And they can be difficult to find in the states,” adds Hodges. Getting the materials to Guatemala is also a challenge, but Hodges and other staffers have found ways to connect with volunteers traveling to the region and willing to cart along a suitcase or two full of books for the children. In fact, one of TCC’s own, Kole Matheson, a library specialist and ESL instructor, traveled to Guatemala to deliver a load of books, while on his honeymoon.